The composition of dissolved organic matter (DOM) in rivers results from the different sources and in-stream transformations along the land to ocean aquatic continuum. Riverine DOM sources are highly dependent on the hydrological connection between the river channel and the surrounding terrestrial ecosystems, but how the lack of this connectivity (e.g., during drought episodes) affects the sources and biodegradation of DOM in rivers remains unclear. Here we identified the DOM sources as well as the different DOM pools that are respired along a Mediterranean river during drought by combining absorbance-fluorescence spectroscopy, size-exclusion chromatography, biodegradation assays, and stable and radiocarbon isotopes. DOM composition was highly heterogeneous along the river in response to different sources and in-stream processes in each distinct aquatic environment (i.e., isolated water pools, running waters, and impounded waters in weirs). The reduced hydrological connectivity with terrestrial ecosystems promoted the influence of autochthonous DOM sources. Still, tree leaves from overhanging canopies stood out as an important terrestrial DOM source, especially in sites where water residence time was high such as isolated pools and weirs. 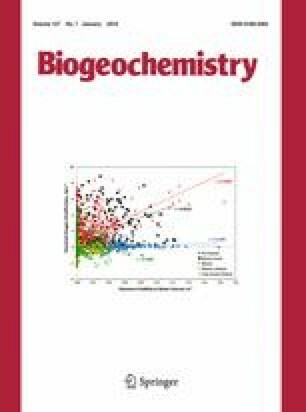 Degradation of leaf leachates was a relevant process in these sites, whereas autochthonous DOM and groundwater millennial DOM (>1300 year B.P.) seemed to be degraded in running waters. Overall, our results highlight that the drought-induced hydrological disconnection entails a great spatial heterogeneity in the sources of DOM, which at the same time determines the different DOM pools that are respired in each environment along the river. Responsible Editor: J. M. Melack. This research was funded by the Spanish Ministry of Economy and Competitiveness through the project CARBONET (CGL2011-30474-C02-01). J. P. Casas-Ruiz and Ll. Gómez-Gener were additionally supported by FPI predoctoral grants (BES-2012-059655 and BES-2012-059743), and D. von Schiller by a “Juan de la Cierva” postdoctoral grant (JCI-2010-06397). N. Catalán held a Wenner-Gren foundation stipend (Sweden). Authors also acknowledge the support from the Economy and Knowledge Department of the Catalan Government through Consolidated Research Group (2014 SGR 291)—Catalan Institute for Water Research. We thank Lorenzo Proia, Yvonne Rosenlöcher, Meritxell Abril, Susanne Halbedel, and Carmen Gutiérrez for lab and field assistance.